The legend of the Wiltshire moonrakers is well known, but while the outline of the story is well documented, filling in the details largely depends on which book you read. The story is simple, though, and its message clear. 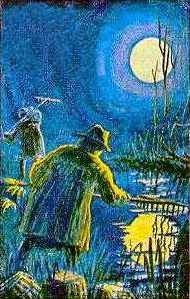 A pair of Wiltshiremen, engaged in smuggling brandy, hide a barrel of the contraband from the excisemen in a nearby pond and when they return at some later time, in the dark, they are caught in the act of raking the barrel back to land. They immediately claim that they are trying to rake cheese - the reflection of the moon - from the pond and the excisemen, amused by the apparently simple-minded rustics, leave them to it. The moral of the story is that, despite their earthy accents, Wiltshire folk are not as slow-witted as some would believe and, to this day, people born in the county are proud to call themselves moonrakers. Just when the incident took place is far from clear, particularly as smuggling is by no means restricted to any one period in history, but at least one historian has claimed it originated in the 18th century. The site of the pond is a matter of fiercer conjecture, with any one of the many Wiltshire towns and villages which boast a pond laying claim to be the home of the original moonrakers at one time or another. Bishop's Cannings, which has produced a number of tall stories over the years, is named in one book, Ralph Whitlock's 'Wiltshire Folklore and Legends'. He claims the two original moonrakers were from this village, which is a stone's throw from Devizes and its suitable pond. Local people certainly seem to favour Devizes as the site of the pond. Perhaps there are some clues in the verses written by Edward Slow, which are reproduced below. Published in 1894, this is at least closer in time than the modern versions of the story, though that, too, has surely been coloured by time. At the end of the day, there isn't even any evidence that the story is based on fact. Most fables are fiction. Whatever details the original story had have been twisted and lost as the moonrakers' legend has been handed down from generation to generation. And that's exactly as it always is with all the best legends. Were the Moonrakers really as ‘slow-witted’ as they appeared to be? Why do you think Wiltshire people ‘are proud to call themselves moonrakers’? Why do you think no one really knows the exact location of the pond in the legend? Why are country folk generally considered to be ‘slow-witted’? Are there similar legends from your area that explain why people have a particular name or reputation? Wiltshire is famous for dairy products such as cheese as well as those produced from pork, such as ham, sausages and bacon. What is your area famous for? Can you think of any other legends or myths that are passed on from generation to generation within your family, country or culture?